Butcher, from Transhuman Design, is a gritty low-rez sidescrolling actioner inspired by 90's era corridor crawlers with a strong focus on loud blasts of gunfire, huge sprays of blood, and the pained screams of fallen enemies... with a deep thudding guitar hammering away beneath it all. 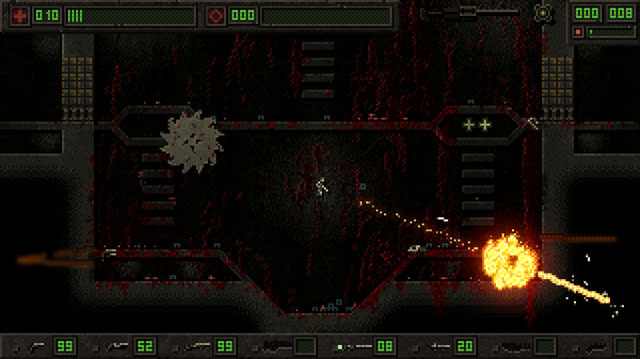 The game world consists of open industrial environments with spinning saw blades and pits of acid, and the walls become soaked with blood as enemies are taken apart by shotgun blasts, machine gun fire, flamethrowers, and RPG's. Players are able to move and aim independently with keyboard and mouse controls, similar to Abuse and a number of modern day twin-stick sidescrollers. Oh, and you can kick enemies around - and they scream when you do it - allowing you to knock them back into acid, toss them upward for some midair shotty action, or just kick their corpses around. As the game states, "Meating people has never been so fun." Butcher is now available for PC, Mac, and Linux via Steam, GOG, Humble Store, Itch.io, and cdp.pl. Check our coverage here.